"Wouldn't that sort of defeat the purpose of having FLY? Location: Utah! Where the population is like rabbits. to a point. you can still fly around from slateport to lillycove, but some people like me, sometimes like to take the boat instead sometimes." If that idea is implended though, there would have to be a reason to go on the boat, like the battles. Maybe have a set for each port/bay. 1. To Olivine 2. To Neo Bay 3. To Gallia City. Etc...doesn't matter where you start, but where your destination is would be what changes up the battles. Is it possible for headbutt trees? I found a tile on the internet of the little shaking awesome trees. Just an idea. If not that, how I'm talkin bout a possible move tutor in Roothaven, with headbutt, maybe his house could contain the trees as just a cool reference. Last edited by Quinn; 06-29-10 at 05:13 PM. DO U LIKE WATER????? then u like 75% of me. Yes, it is possible to headbutt trees. They even have their own set of encounter rates. we are gonna have them? Maybe I missunderstood or something, but if so AWESOME. Do you need the tiles? I got them, and I kinda think they are better than headbutting any tree. Many different mugshots are in the games. Intro's to the battles. What am I talking about you ask? Of course we are gonna have an intro, that isn't even really needed as a suggestion. But heres a reminder like. Last, if we even keep the battle frontier idea, maybe we could add/replace some? The new dome thing, the castle, and ESPECIALLY the lucky flip thingy. (I murder in that one) Dont answer this one though, since this one is way up in the air. Last edited by Quinn; 06-29-10 at 11:38 PM. Quinn, there are small headbutt trees in pretty much every map done by Fangking. You can rip it off of one of them. wtf? I can't see them. maybe you could post one up? edit: Look above, although I put that up an hr ago. I also noticed the mugshots I was talking about weren't up so here. This is what I'm takin bout. Last edited by Quinn; 06-30-10 at 12:18 AM. Nevermind, they're only in a few Topaz maps. I thought he put more in there because I had just been browsing the Acanthite site the other day. And as for all the artwork that require a high level artistic skill, e.g. mugshots and location intros, those are out of consideration for now. Way too much time and effort involved. I never knew they were in cities. should I put them in the cities I build up? We don't mainly because we don't know which places will have headbutt trees. Just like how we made a few generic inland water fishing encounters mainly because we mostly don't know where water will be outside of oceans. 2. USE MY TITLE FOR THE DEMO! I finally was able to play triple triad, and I saw the yellow one. Nothing against it, but it was replaced. Wow, it's been a while since I've been on here. Anyway...I'm a little worried about the gym order and typing. I know that a lot of them have been finalized, but it just seems a little...off. Anyone who picks up Venap at the start is basically screwed, as there are gyms for all five of Grass' weaknesses, only getting one advantage (Ground) and two resistances (Electric and Grass). Echoise users get the short end of the stick as well...gyms for both of Water's weaknesses, and only two advantages (Fire and Ground) and one resistance (Ice). Meanwhile, the guys that picked Celsinge have it easy, beating the 4th, 5th, and 7th Gyms, as well as the 3rd if they already have Kelvoyant at that point. There is only one gym that beats Fire (Ground, the last one) and one that resists it (Fire, the first). On another, but noticeable note, I'm also worried about a Bug gym immediately following a Grass one, as they share two weaknesses (Fire and Flying) and one resistance (Ground). Unfortunately the group who worked on the early Topaz concepts weren't much of competitive battlers. Maybe it'd be better to leave it as is though, so that people who prefer to solo with starters can just pick the Celsinge line and the ones who enjoy putting together a competitive ingame team can use Venap or Echoise. That way we have something for both types of Pokemon ingame players. I'm more worried about people taking Venap without realizing what they're getting into, and being unable to use him in the first five of what are essentially boss fights. And you bring me to another idea. I remember someone mentioning about a month ago (when I was asking about the Whispaw line) that all of the movesets were finalized early on in the project, and how some of them appear to have been made before the Physical-Special Split was incorporated. Since it's apparently been a while since then, and there appear to be more members with at least some competitive knowledge, maybe we could go through the Dex again, one evo line at a time, and give people a chance to come up with ideas to improve their stats and movesets (like how desperately the Spidream line needs Signal Beam in its level-up movepool instead of as a breeding move, or how the Echoise line learns an unnecessary amount of mid-power Water moves). Yeah that would be good to do, but probably not realistic to do for the demo. Once work on that is done, we can focus more on this and revamp moves. Coming full circle again, I have another post-demo idea...another idea for a Special Light attack...but this time it's a move that already exists. Aurora Beam is called "a rainbow-colored beam" in its description. The move clearly invokes light in it. And the only reason it's an Ice move in the official games is because the official games don't have a Light type yet. With a couple tweaks (increasing its BP to 95, dropping its uses to 15, and changing the secondary effect from lowering Attack to lowering Special Defense or Accuracy), we can use it as the strong-but-reliable Special attack the Light type is missing. Special-based Light types would gain something to sweep with that isn't the relatively innacurate (and rare) Wrath or the too-weak-to-sweep-with Light Wave. You might be thinking "What about the niche Aurora Beam had as an Ice move? Where are we going to get a mid-power Ice attack to replace it with?" Once again, the answer is a move that already exists, but this time it's one that has already been made for Topaz. Right now, Cold Wind is all but redundant. It's almost exactly like Icy Wind, which was introduced in 2nd Gen: both are Special and both have a base power of 55. The only difference is the secondary effect, which itself is just like Powder Snow's effect. If we raise Cold Wind's base power to around 70, and give it a new name that differentiates it from Icy Wind, it could fill Aurora Beam's old niche. Of course, this would involve having to change at least a few movesets around, so it would have to happen after the demo gets out. Actually, let me change that a little. Aurora Beam seems a little...harder for a Pokemon to use than Light Wave (firing a rainbow-colored beam vs sending off a wave of light). Maybe we could keep Aurora Beam's BP at 65, but boost Light Wave's to 80-95, making Aurora Beam the less common mid-power move (a la Bubblebeam, Silver Wind, etc.) and Light Wave the strong-but-still-practical one (like Surf, Thunderbolt, Flamethrower, Floral Storm, etc.). I wish I knew about moves as much as some of ya'll. I just teach em what I want, I dont know all the combo's and techniques. Zenith has a good idea here. I'm probably partial because I loved the RSE animation for Aurora Beam, but he does bring up some other valid points as well. I'd be fine with having Aurora Beam be a 95 BP move. I think I got that wrong, but do you mean have Light wave become the 95 one. I'm not sure if I read that right. I read it like 5 times, and thats what I get. *I love the RSE one as well, if I can get my hands on it with battle animations, I wanna try to restore it, kinda like Psychic, surf, and my Mean eye I've got saved. I say Aurora Beam be the higher BP one, it's more concentrated. Either way, we'll need a TM for the one that ends up with 95 BP. Alright, I got more. They're big and a little...controversial, for lack of a better term, but they should help make the game a little less linear. I think we all notice that the map has you running into gyms so fast early on that you have five badges a third of the way into the game. Furthermore, there are a lot of Grass/Poisons out there (albeit less in Topaz), and enough Poison moves learned by Grass types for there to be overlap between the 3rd and 4th gyms; worse is the fact that the 4th and 5th share two weaknesses and a resistance, and the weaknesses are to the extremely common Fire & Flying types (the C/K Dex has 22 Fire and 24 Flying types in it). My first suggestion to fix this is...push Hanzo's gym from 3th to 6th. The first time the player reaches Mistvale, the gym is closed, and a NPC nearby or a sign on the gym mentions that he's training on Mt. Mist. The player would continue on, going around Mt. Mist. Fernando, Mandy, and Gerad would all move up one spot. -Therma would unlock Cut, as there's no way it won't be needed to get through Chartree Forest. -Fernando, Mandy, Christina, and Osiro would keep their unlocks. ...The player would need to use Flash to ascend Mt. Mist. Maybe there's some kind of message in the "entrance room" that gives directions to move on. They can't be read without Flash, and even if you know what to do the game won't register it unless you read it. Maybe there's also a part outside the mountain higher up, where Flash needs to be used to see through the thick fog surrounding the upper mountain. Getting into fights without Flash on decreases your Pokemon's accuracy in battle, but not the local wildlife, as they're used to it. Reaching Hanzo on the summit and talking to him convinces him to accept your challenge, and return to Mistvale. Gym Lightning Tour partially solved, and we don't have to worry about Hanzo becoming That One Boss because he has a Dragon type (Drakodo) in the third gym. Keep checking, as I have another one hopefully ready soon...a possible replacement for the Bug gym that could fix some starter balance, give a little more story depth, and give a type some much-needed Gym rep.
that actually sounds like a good idea. I'm for it, although You dont battle Therma until after Froy, which means you have already gone through chartree forest and back. The skewed gym leader lineup has been bothering me for a while now. I'm glad that there are others that share my view as well. However, Mt. Mist plays a part in storyline events, and so must be immediately accessible. This also means Flash will have to be enabled by one of the first three gym leaders. Another concern is the fact that all the gym leaders are based in Caldera. This was decided at the very beginning of Topaz, and while I can see the appeal in it, it's not practical in gameplay. What I want to do is increase the number of total gyms to 12: 6 in Caldera and 6 in Kirant. This should help even out the distributions of the gyms. OOHHHH HELL YA!!!! MORE GYMS! As long is one is water, I'm all for it! Six in each? How will they flow? I'm guessing they won't all be in order (All 6 Caldera, then all 6 Kirant), right? And this way my idea for a Dark gym works perfect, and we don't necessarily have to move Mandy to the Elite Four! But she still can't be right after Fernando...maybe move her to Kirant? Maybe make the early-story-relevant part of Mt. Mist lighted? @Quinn: Flash is a priority move now, with 50 BP (10 higher than Quick Attack, Quickbolt, etc.) It's too good now to give away too early. And I was under the belief that Chartree Forest was west of Softwind. So lemme change what I said before a little: Froy unlocks Cut, Therma unlocks Rock Smash. Out of the eight gym leaders that we have right now, Therma, Mandy, and Christina are connected to the plot, and I doubt we'd want to get rid of Froy and Osiro. That leaves Hanzo, Fernando, and Gerad as "expendables". I would definitely want to get rid of Fernando, because his gym type overlaps with Mandy's. Gerad is a good choice to get rid of, but I had some good gym puzzle ideas for him. If we get rid of Hanzo, then I suggest moving Therma's gym to Mistvale. Still, this is an early concept. Even if everybody thinks it's a good idea, more gym leaders means we'll need more sprites, and possibly have to redo the Pokemon selections. There is all three of the starter types, grass, water and fire. There is more disadvantages for all except fire, to add a bit of challenge to put more into your team. Not exactly that, but still, there could be a base. Don't we only have 11-12 Light types? It just seems like Light would work better with an E4 member. To be honest, I'm a little worried about having 12 gyms. If we pull it off right, it would be amazing, but it has to be done in a way that doesn't make it feel like there's too many. Depending on whether the Champion focuses on a type or not, there will be either 16 or 17 types covered, which means if we have more than one under-represented type, we're in trouble. We'll also need to make at least a couple more towns, so there are more that don't have gyms. We can't have it feel like the gyms are everywhere; there needs to be enough civilization around to justify having 6 of them on each half of the map. 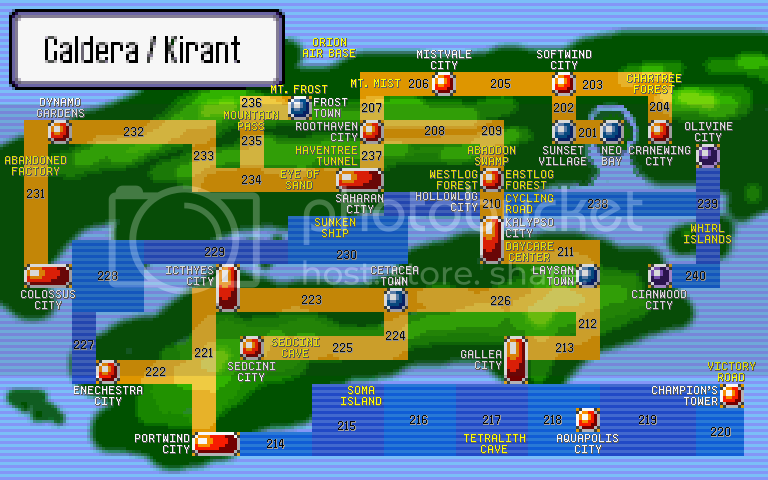 Remember how Kanto & Johto only have two cities in each that don't have gyms? Hoenn has six, and it adds a lot of depth to the region. Not to mention that there is way too much uninterrupted horizontal space in Kirant. What part does Mandy play in the story? Personally, I'd rather keep Fernando if we have to get rid of one (or move one to the E4). The Venap line would keep a resistance and lose a weakness (in Dionare's case, a double weakness). Last edited by Zenith; 07-06-10 at 07:42 PM. Don't forget that we don't want to use the same types as the elite four trainers. iirc that means no Water, Light, Dark, and either Steel or Normal, can't remember that one. I definetly think we have enough towns. The map is HUGE. (if you haven't seen it then look here) we have about 23 cities. I think were safe there. You do have a point about the elite 4 though, but when they introduced steel they had it as jasmine (which is returning in Olivine ) ,but then there was also a dark elite 4 member. Idk. If we pull it off, it will be AWESOME (like you said). I know that is just a quick list, but at least its a base. And as long as we keep water. Mandy is actually pretty important to the plot regarding the Westlog and Eastlog forests, and also factor in later on in the current version of the story, which is being revamped due to overcomplicatedness. I'd rather remove Fernando. Are 6 in each really needed? Kirant is slightly smaller, and there is a lot of stuff going on there. 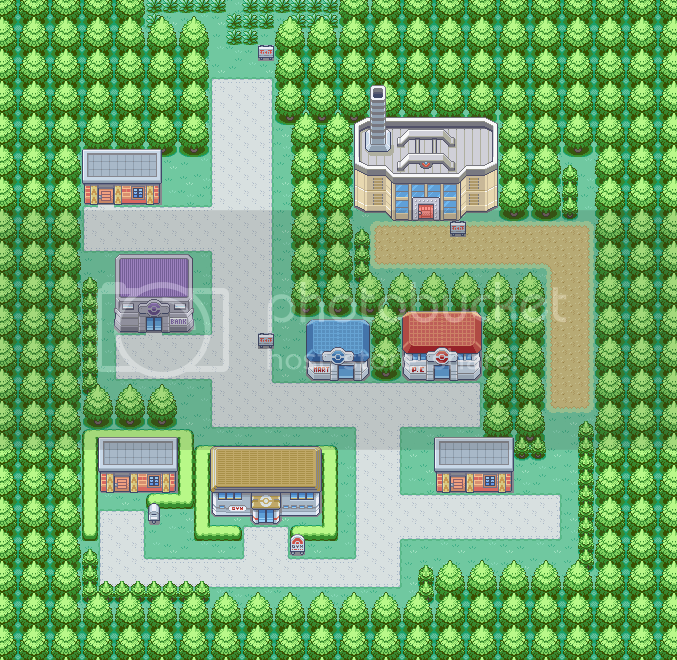 I could potentially see one in Gallea and one in Sedcini maybe, but the others are either the main bases for the teams or don't really provide the gym kind of atmosphere. But yeah, no Water, Dark, Light, or whatever type the fourth one is (might be ghost too, I think Ferrian is his last pokemon). Moving on, to my gym idea. As we all know, Dark has yet to actually have a gym. We can potentially remedy that, and fix some of the starter imbalance. Dolphure would gain an advantage, Dionare would gain a resistance, and more importantly, Kelvoyant would gain a weakness. This would especially help if this replaced the Bug gym (if we go with 8 gyms; irrelevant if we go with 12). This gym would be somewhere in central or eastern Kirant, under the Defenders' influence. This is important, as the gym would have an emphasis on "Dark Is Not Evil". I'm not exactly sure about the gimmick yet, to be honest (limited vision is cliche). The leader's name would have to be one that has a real-world bad rep (Cain? ), his/her signature 'mon would be Abyssus, and he/she would give the player the Crescent Badge (as in crescent moon) and the TM for Nightfall. EDIT: We could still keep Mandy important to the story. She could be a part of the conflict around Hollowlog, and a strong trainer. The player won't see her again for a long time, until the Champion's Tower (or whatever we decide to call it), when they've all but forgotten about her, and they run into her...as an E4 member. As a nod, she could mention that she used to be a gym leader before the League requested that she become a member of the C/K Elite Four. And I still think we can do more with Mt. Mist than just make it a dungeon you have to go through along the way. In addition, I have a couple small ideas for messing with Light type a little, for more balance. Last edited by Zenith; 07-06-10 at 07:53 PM. The first three (or two) gyms already put Venap users at a severe disadvantage. Choosing Venap is basically like choosing hard mode, one more disadvantageous gym won't do much. Also, any smart trainer would pick up at least one or two more party members, so don't be so hung over on gym types just because of the starters. More cities? Really? Discounting Olivine, Cianwood, and (soon-to-be-renamed) Champion's Tower, There are a total of 20 cities, 11 in Caldera and 9 in Kirant, more than enough for 6 gyms each. Add to that the various Rocket/Orion subquests, backtracking, and overly long routes, your concern should be the absence of gyms. I also don't want Rocket or Orion having their own gym (I'm writing up a new background for Christina), we can have a Dark-type gym but I doubt we'll be able to put forward the "dark is not evil" message (which it actually is; the Japanese word used for Dark-type literally means "evil"). I'm aware of Japanese name. I just feel like it's a little cliche. It doesn't necessarily have to be Orion-run, just in that area, as it seems to be along the way. (What is the overall flow from Hollowlog to Dynamo, anyway?) Another idea for its origin is that it's a recently built gym, made after an E4 member retired/resigned/got fired and Mandy took that person's spot. The League got the idea of building a Dark gym, as there hadn't been one before that point, as Dark types were seen as Always Chaotic Evil in the past, and not all of them are. An eastern Kirant city...let's say...Laysan(?) volunteered to have it built there, and a pro that was raised there volunteered to become its gym leader. Absol just happens to be the franchise's poster child for Dark Is Not Evil. Again, any thoughts on tweaking Light a little? Last edited by Zenith; 07-06-10 at 08:49 PM. Maybe... the extra 4 could be optional? You would only have to do 8? Just a thought. I'm not necessarily a fan of the idea myself. There would be some balancing things that I would do with Light as well. Even though I generally hate changing things after it's already been decided, I believe that we can give ourselves the oppurtuniy to grant Poison STAB a reason for existing and therefore help balance out the metagame. But yeah, no Water, Dark, Light, or whatever type the fourth one is . I hope your not talkin about a gym. If your talking about no water gym, wtf? If we put another in one of the ports, shouldn't one be water, knowing the sea would be like 30 steps away? I'm not so sure about the light type and the poison stuff...I'm not smart in that field, sorry. I like the idea of "dark isn't evil" with the elite 4 replacing and all that stuff. We definetly don't need anymore cities. Isn't there like 22 or something? 6 gyms, 22 cities...you see? We should have at LEAST 8, and I still kinda think 12 would be better. There would be the battle gyms, and the "breath taker" towns, along with the orion/rocket stuff and all the sidequests. Actually, that's part of what I was thinking. The first change would be to change Light's resistance to Poison to a weakness, and give Poison a resistance to Light. We could probably say something about how even the most righteous can be corrupted if they don't watch what they do, but (more importantly) it gives Poison an advantage that isn't already covered by four other types. Secondly, we need to do something about the Dark-Light-Psychic triangle of immunities. It just seems unecessary, and could limit all three types in the metagame. The only reason Dark is immune to Psychic in the first place is because Psychic was overpowered in 1st Gen and needed something immune to it to bring it back down to earth. Dark isn't overpowered enough to warrant making Light immune, and Light won't be overpowered enough for Psychic to be immune to it. Change Light's Dark immunity to a resistance, and take away Psychic's immunity to Light, and Dark and Light both become more useful as attacking types. And one slight change in what resists Light. Right now Steel resists Light. While it makes a little sense, Steel already has 11 resistances and an immunity, and doesn't really need another one. Being able to deal neutral damage to Steel will, once again, help Light on offense. We can give a different type some much-needed defense...by making Ice resist Light. As of right now, the only thing Ice resists is itself. Giving it resistance to Light makes the type less of a glass cannon, and means Waters actually gain something from being part Ice besides a resistance it already has. We may need to give Light a third advantage, though. Any ideas, if needed?